Electronic cigarettes have become an international phenomenon, although few studies have compared e-cigarette use across countries. 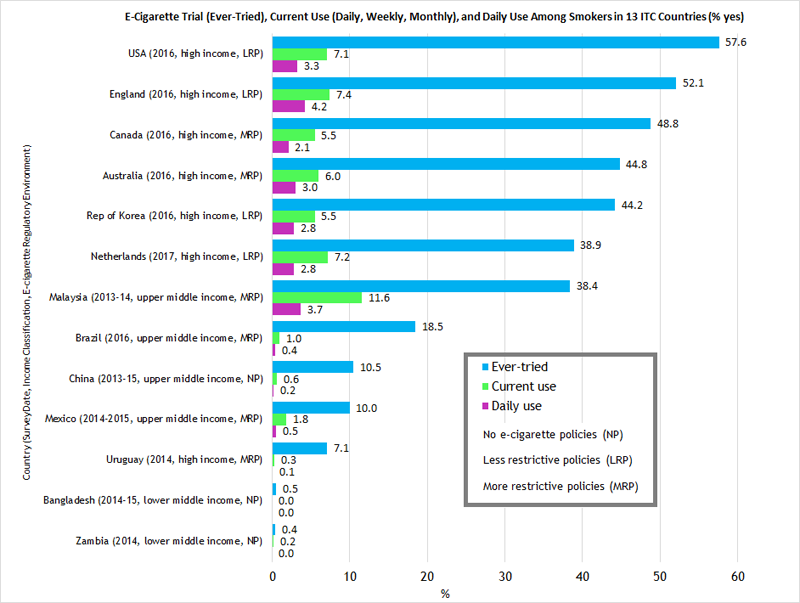 This paper presents prevalence estimates of self-reported e-cigarette awareness, trial (ever-tried), current use (daily/weekly/monthly), and daily use from 13 countries that vary on the strictness of e-cigarette policies/regulations. Cross-sectional analyses of representative samples of adult (≥18-years) current and former smokers participating in International Tobacco Control Project (ITC) surveys in 13 countries from the most recent ITC survey wave (2013-2017). Countries were categorized into those with no e-cigarette policies (NP), less restrictive policies (LRP), or more restrictive policies (MRP). 1. Awareness: for NP countries: Zambia (2014): 3%, Bangladesh (2014/15): 7%, China (2013/15): 59%; LRP countries: Netherlands (2017): 92%, Republic of Korea (2016): 94%, United States (US) and England (2016): 99%; MRP countries: Uruguay (2014): 52%, Mexico (2014/15): 61%, Brazil (2016): 73%, Malaysia (2013/2014): 86%, Australia and Canada (2016): 99%. 2. Trial: for NP countries: Zambia (0%), Bangladesh (1%), China (11%); LRP countries: Netherlands (39%), Korea (44%), England (52%). US (58%); MRP countries: Uruguay (7%), Mexico (10%), Malaysia (38%), Australia (45%), Canada (49%). 3. Daily/weekly/monthly use: for NP countries: Zambia and Bangladesh (< 1%); China (1%); LRP countries: Korea (6%), Netherlands, US, England (7%); MRP countries: Uruguay (0%), Brazil (1%), Mexico (2%), Australia and Canada (6%), Malaysia (12%). 4. Daily use: for NP countries: Zambia, Bangladesh, China (all 0%); LRP countries: Korea (3%), Netherlands (3%), US (3%), England (4%); MRP countries: Uruguay and Brazil (0%), Mexico (1%), Canada (2%), Australia (3%), Malaysia (4%). With minor exceptions (e.g. Australia), awareness, trial, and use of e-cigarettes across the 13 countries generally reflected the de facto environment rather than the statutory environment implied by the law(s). Country income classification and survey year also appear to be strongly associated with use.